Sittin Pretty is proud to use only the finest ingredients from the United States. All products are made in the USA with all USA ingredients. Using restaurant quality meats and farmers-market fresh vegetables, our healthy slow baked treats are designed with your pet's well being in mind. Our meat-based treats are available in different shapes and sizes to satisfy every dog's personal taste. Healthy slow baked, these treats have a crunchy finish and provide maximum flavor an nutrition for your special family member. Your dog will love them! Whether rewarding your dog for learning a new trick or simply for being your best friend, he or she will relish these delicious treats! Single-ingredient treats are also available for dogs prone to food allergies. Rest assured that you are rewarding your dog with the best treats available on the market today. In addition to healthy natural dog treats, Sittin Pretty has added a new line of natural grooming products! 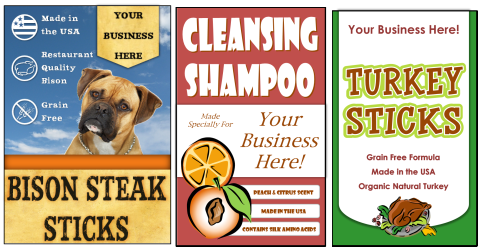 From canine ear cleansers and flush drying lotions to pet shampoos and conditioners, Sittin Pretty offers an array of products to suite your pet's every grooming need. Using ingredients such as silk amino acids, eucalyptus, fatty acids and oat extract, these products will be able to soothe, whiten and cleanse any pet! 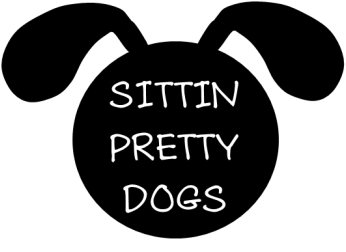 As if offering healhty dog treats and top quality grooming products isn't enough, Sittin Pretty is proud to offer the ability to customize labels for your company. The best part? Private labeling is completely complimentary. Easily incorporate your business name and logo on our Standard Labels or use one of out private label templates for a more customized look. You can even use our label guidelines to design your own one-of-a-kind label. LOW MINIMUM!